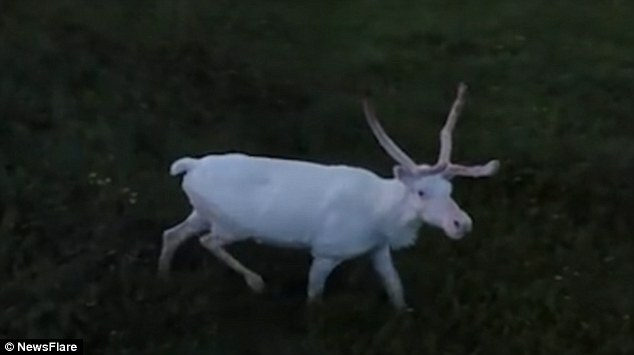 An extremely rare albino reindeer was filmed roaming through the wilderness by a drone, which stalked the creature from a safe distance. 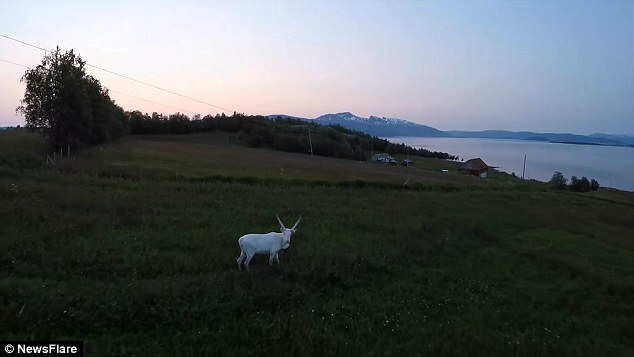 The majestic animal was spotted in an isolated area of (- ... -), Norway by a drone enthusiast who wanted to capture some truly unique footage. Using his quadcopter as a way to spy on the reindeer without startling it, the man flew his camera into the sky and captured aerial footage of it looking for food. He followed it from the air as it walked over to some trees before he later reduced the drone's altitude and travelled towards it. In the clip, the approaching quadcopter causes the animal to jump and run away, before it then stops and turns around to look back at the camera as if deciding whether it is a threat. The reindeer concludes that it isn't going to take any chances and runs away. Later in the video the drone operator flies his gadget high into the sky once again and films the animal from a distance. 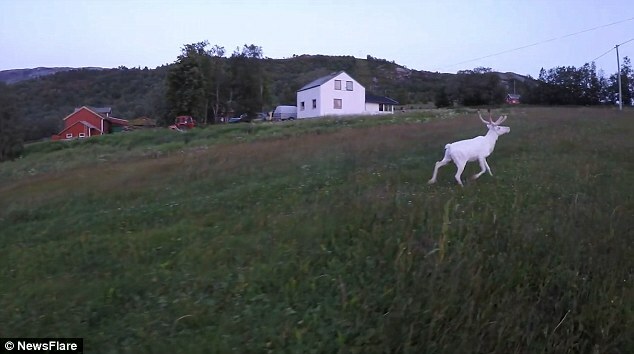 Its white fur causes it to stand out like a beacon against the green surroundings of the countryside. 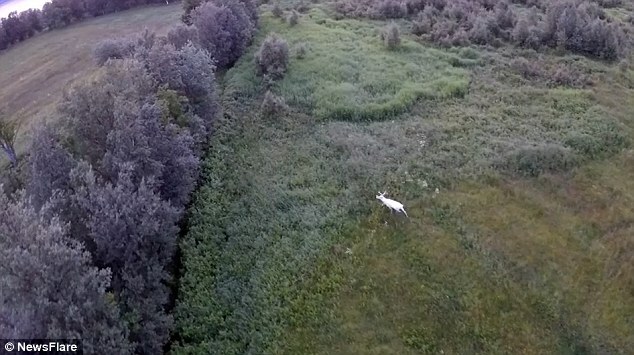 The video concludes with the drone operator deciding he has captured enough footage and flying away to leave the animal in peace. 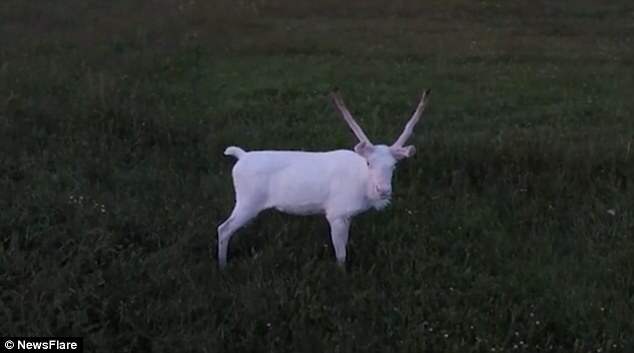 Albino reindeer are incredibly rare animals with a coat of white fur and even a white tail. 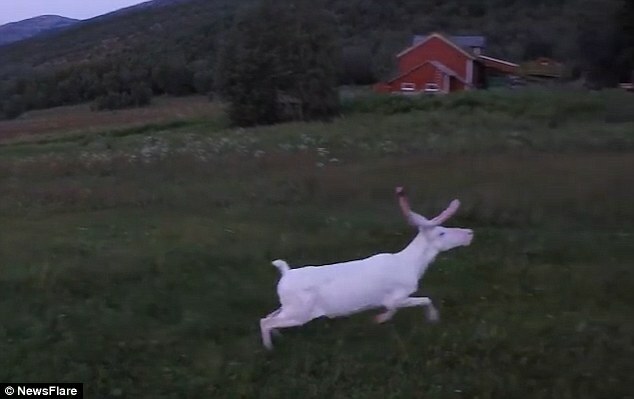 Responses to "Incredibly Rare Albino Reindeer Roaming Through The Norwegian Wilderness"